The Grace Brethren Church, Long Beach, Calif., is one of at least three Grace Brethren congregations that is marking a 100th anniversary this year. (The other two are in Ashland, Ohio, and Rittman, Ohio.) 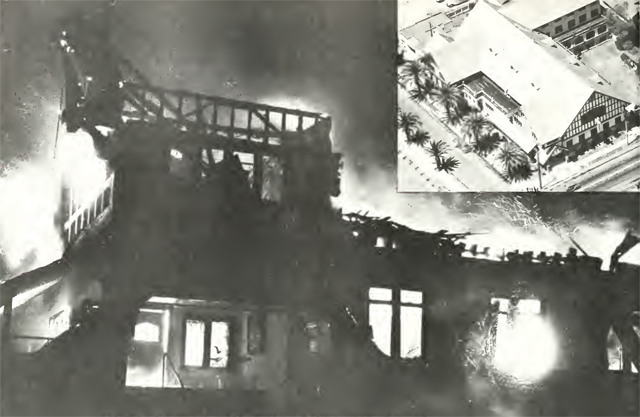 In recognition of that, graceconnect.us dug into the archives of the Brethren Missionary Herald magazine and found this 1978 article that recounted the historic May 1964 fire at the Long Beach church. A portion of the story, written by Donita Dyer, is printed below. Click here to read the complete story from the pages of the Herald magazine. It was noted that this article was the first of a four-part series focusing on Christian education at the Long Beach church. On that never-to-be-forgotten night— Saturday, May 24, 1964— fear gripped church congregations and clergymen throughout the city of Long Beach! Morning newspapers had carried un- believable headlines: “CHURCH ARSONIST STRIKES AGAIN!” Were those four words an ominous portent of things to come? Concerned citizens were shocked to learn that one of the city’s lovely, historic churches had been reduced to rubble and ashes the night before. In the preceding three weeks, several others had also been severely damaged by fire. And the sus- pected “altar-arsonist” was still at large! The same question raced through everyone’s mind: Which church would be the next target? At that time, the First Brethren Church of Long Beach, California, was pastored by Dr. Charles Mayes. He and his wife Marjorie lived in the parsonage across the street, and as tension mounted they kept a wary eye on the property. At approximately 9:30 p.m., our pastor made a thorough check of the premises and found nothing ir regular. Since all was in readiness for the Sunday services, he decided to retire early. But Mrs. Mayes was restless, unable to sleep. Several times she slipped out of bed and walked to the window, or stood on the porch of the parsonage. Recalling it now, she says there seemed to be an uncanny stillness in the air—like the calm before a storm. With growing concern, Mrs. Mayes scanned the beautiful old building across the street. For more than half a century it had been a local landmark at the comer of Fifth and Cherry streets. That night the four-story, eighty-room structure and its stately palms stood in shadows, but the glowing cross was starkly silhouetted against the sky. The entire scene was familiar and had such a look of permanence. Reluctantly, Mrs. Mayes turned to go inside, but the sound of screecliing brakes and running footsteps caused her to freeze. As she watched, a shadowy figure darted toward the church, peered through one of the windows, then sprinted to a waiting car and sped away. Mrs. Mayes rushed inside to awaken her husband. By the time he dressed and they reached the front porch, flames could already be seen flashing across the sanctuary windows. In a matter of minutes, crimson tongues of fire licked at the walls and velvet drapes of the baptistry, devouring the altar and pulpit with great, greedy gulps. Their hearts sank at the sight! Click here to read the complete story from the pages of the Herald magazine.